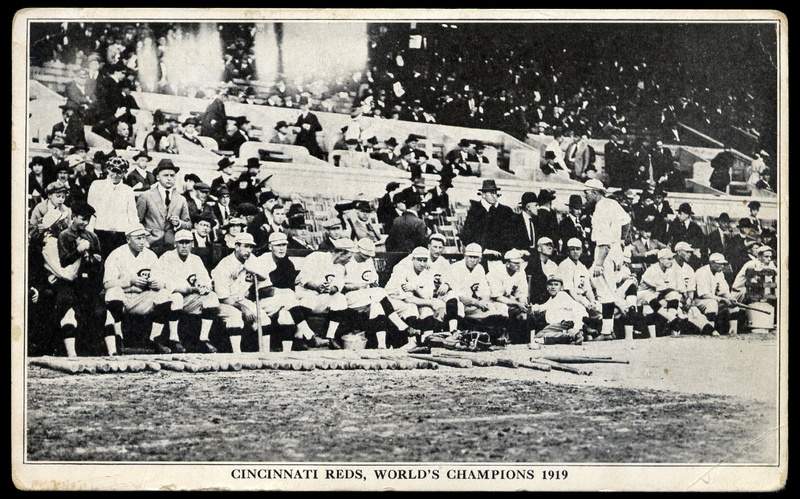 The 1919 champion Reds were celebrated in two related postcard set: one crowning them National League champs and a second referencing them as "World's Champions." 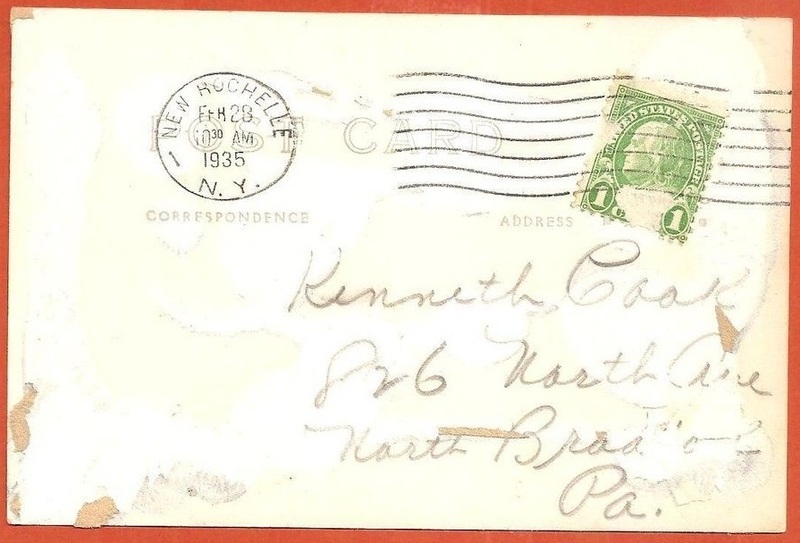 The former includes a credit on the reverse to The Feicke-Desch Printing Co. of "Cin'ti." This set of postcard-backed Exhibit cards from the Eastern Exhibit Supply company is technically a postcard issue, though it has long been listed in baseball card price guides. 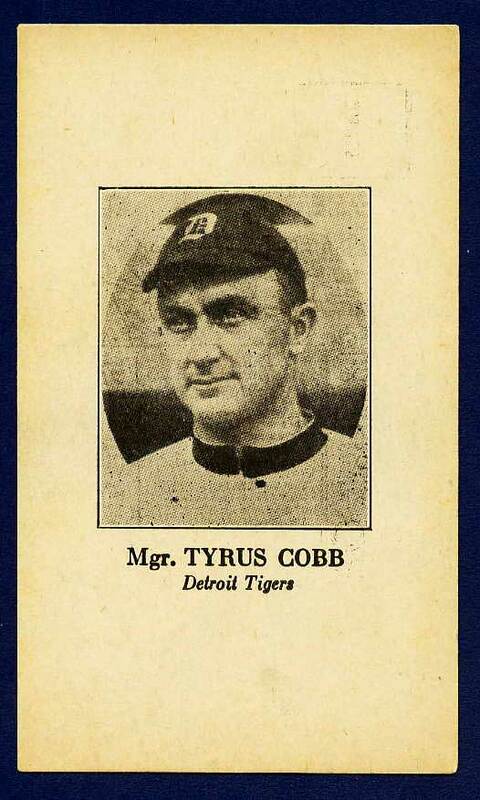 This particular example depicts Ty Cobb. 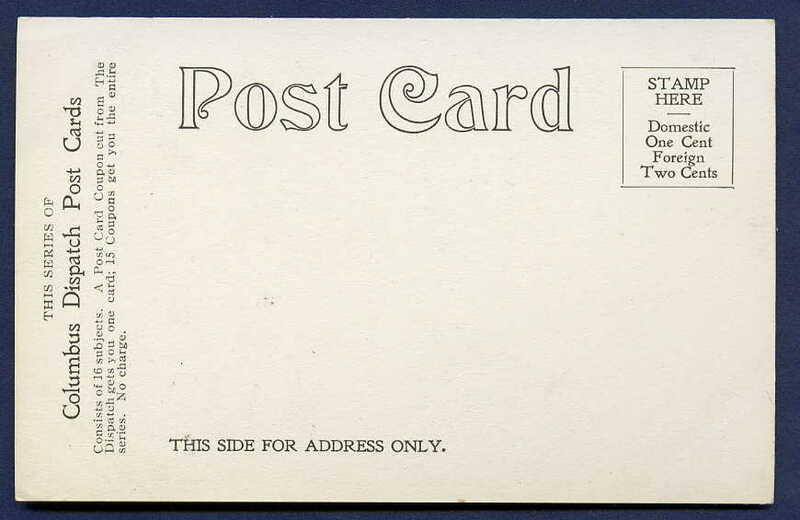 Other postcard-backed Exhibit cards also were issued over the years, including 1927-1929. 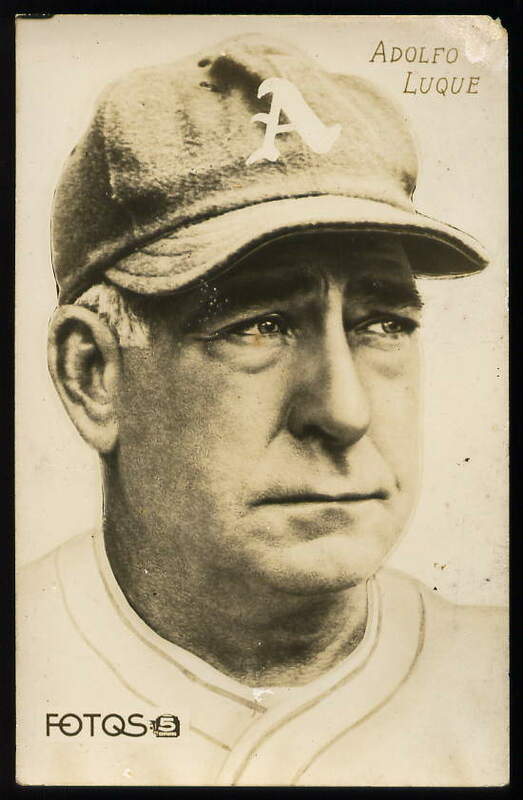 Mid-1920s manager portraits from an unknown publisher. 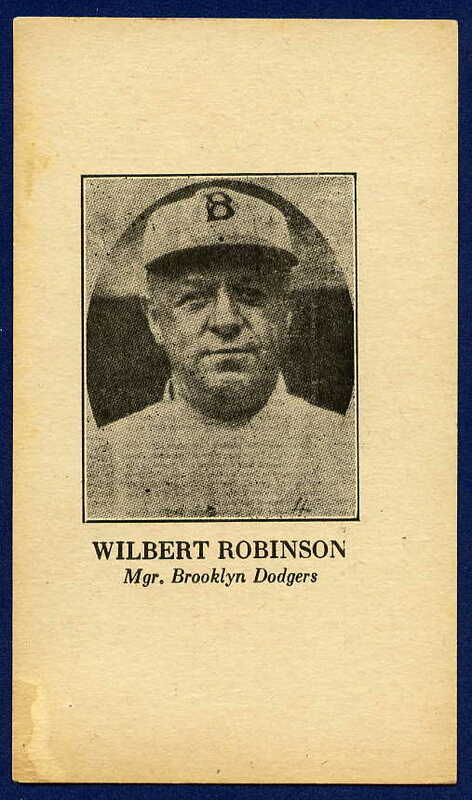 Luminaries include Tigers Manager "Tyrus" Cobb, Brooklyn Dodger Wilbert Robinson. A recent "trunk discovery" has yielded a small number of the heretofore highly scarce series. with newspaper-like photos. c. 1920 Real Photo postcard of members of the Red Sox warming up at Fenway Park. 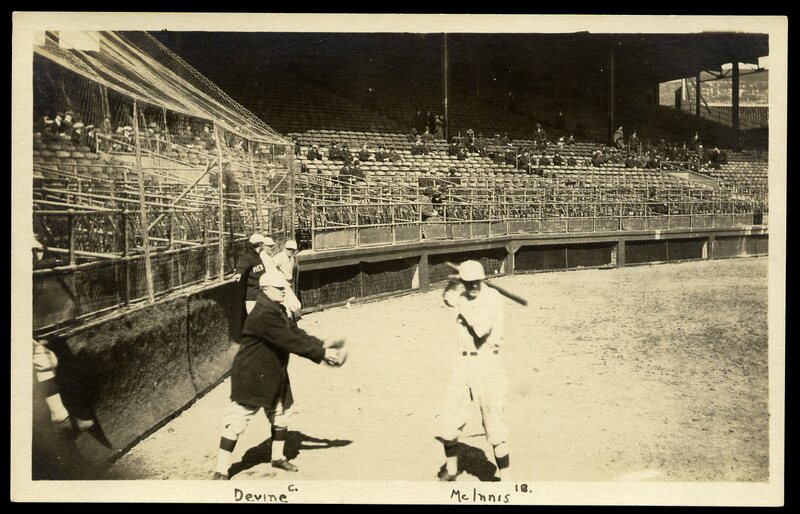 Catcher Mickey Devine and infielder, Stuffy McInnis can be seen in the foreground. 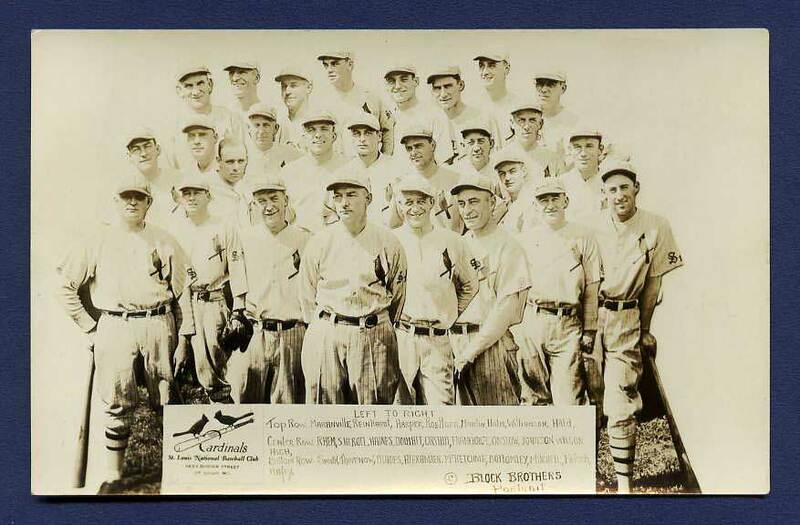 Real-Photo card published by Block Bros., depicting the entire 1928 St. Louis Cardinals powerhouse team. 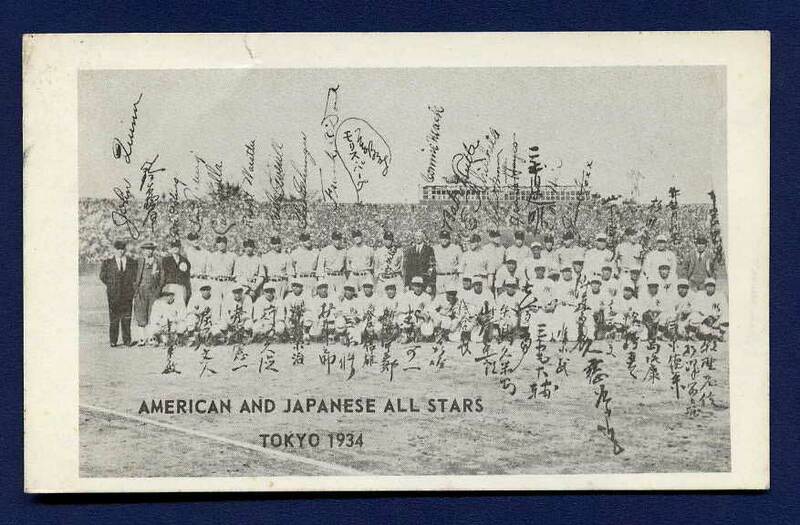 An unknown publisher issued this postcard of the 1934 Tour of Japan. 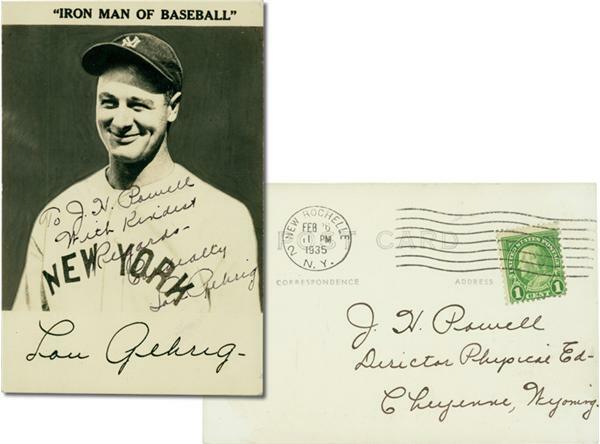 In addition to Babe Ruth, Lou Gehrig and others, note the facsimile signature of Moe Berg in English and Japanese. These two postcards were part of an obscure send-away set issued by The Columbus Dispatch newspaper in 1906. Readers sent in coupons clipped from the newspaper in exchange for one of 16 cards of the Columbus team -- "Twice Champions of the American Association." Interestingly little history has survived detailing Coulumbus' successful entry into the long-ago forgotten American Associaion. The card on the lower left features a packed house at a game between the Columbus and Toledo teams. 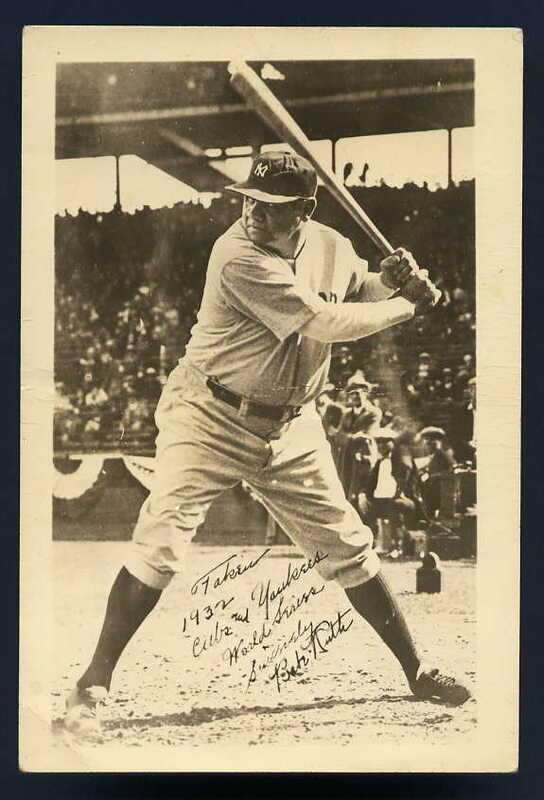 This Real Photo card captures Babe Ruth at the plate at Wrigley Field, with his notation in the negative: "Taken 1932 Cubs and Yankees World Series Sincerely Babe Ruth." It was during this series that Ruth hit his famous "called shot" home run. 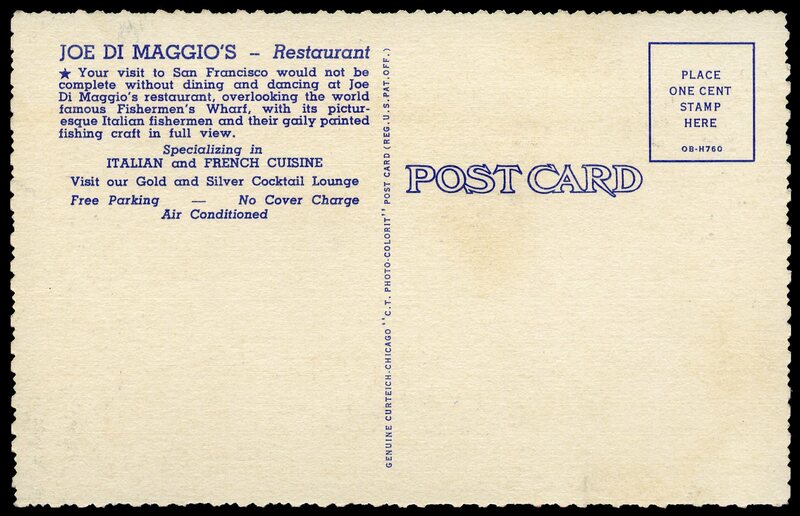 Classified by Ron Menchine as a premium postcard -- implying it was a give-away during or immediately following the World Series. Some have speculated that it was a newspaper premium, similar to contemporaneous larger size cataloged Ruth premiums. 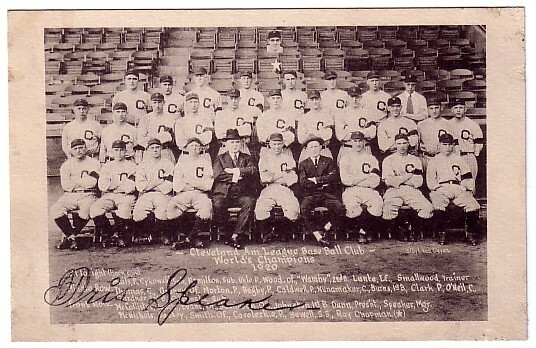 Team postcard of the 1920 Cleveland Indians, with a photograph by famed news photographer L.Van Oeyen. 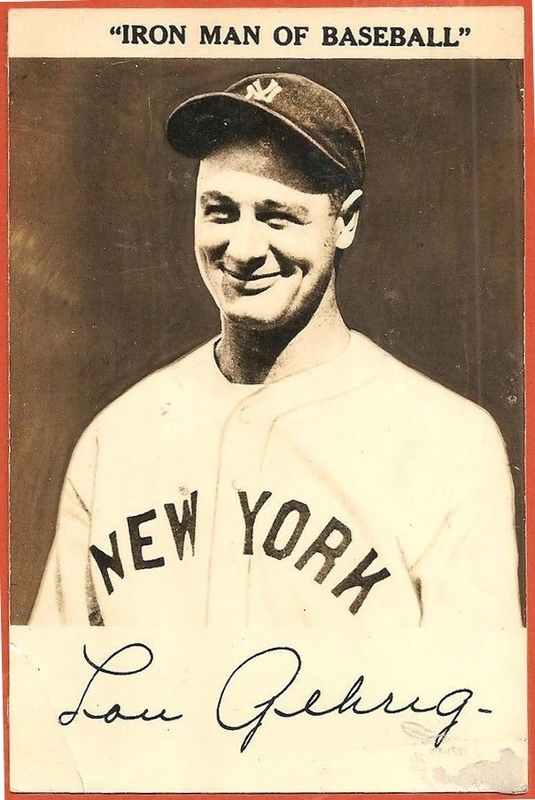 The card boasts a signature of manager Tris Speaker. This card has been seen more than once with the signature in the same location, so it may be printed on it. 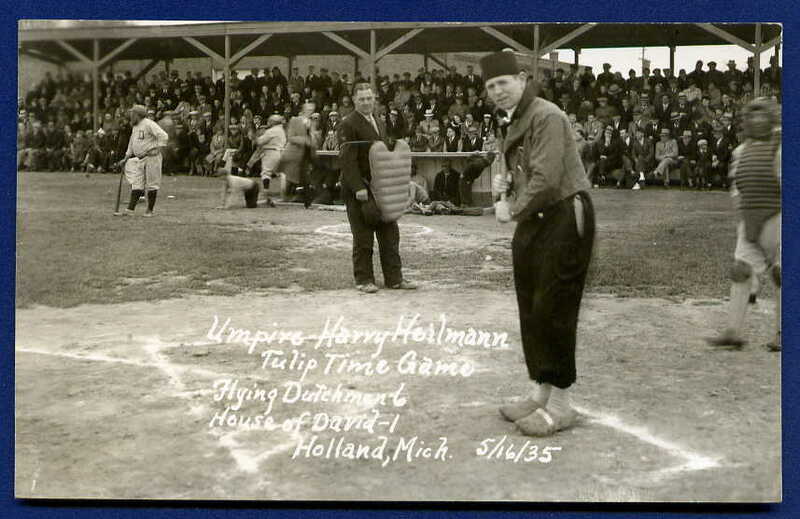 A bizarre Real Phopto postcard of Tiger Hall of Famer Harry Heilmann as umpire of a 1935 House of David barnstorming "Tulip Time" game against the Flying Dutchman (complete with wooden clogs). For more House of David cards, visit the Real Photo Gallery. 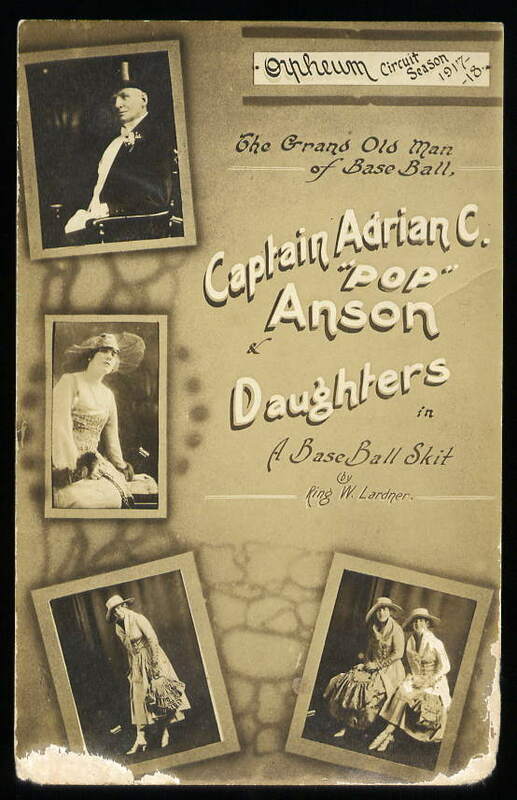 This truly fascinating and rare 1917 card depicts "The Grand Old man of Base Ball, Captain Adrian C. 'Pop' Anson & Daughters in A Base Ball Skit by Ring W. Lardner" on the Orpheum Circuit during the 1917-18 season. The card is a Real Photo postcard. 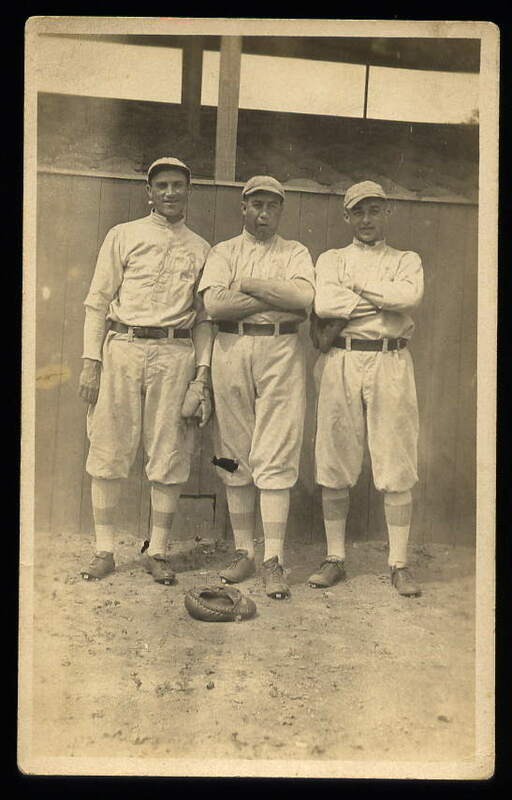 Three unidentified players, said to be three members of the Philadelphia Athletics team, are featured on this Real Photo postcard. 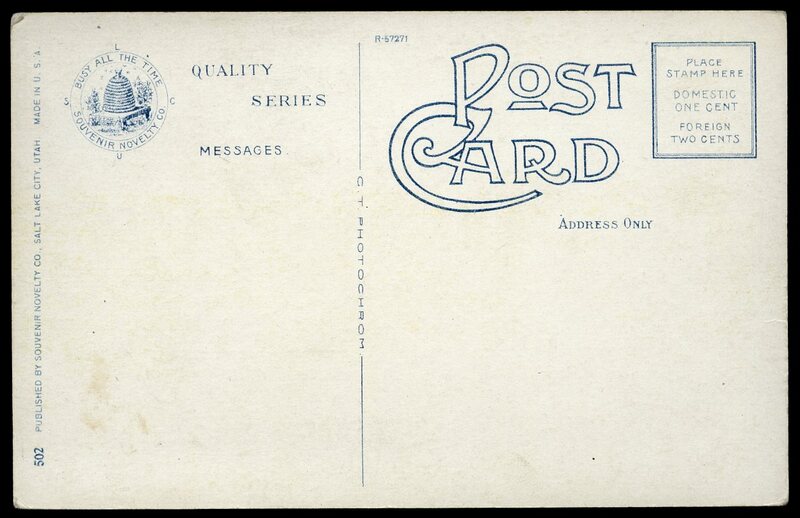 Printed on Velox paper that dates from 1907 to 1914, this card may actually be from 1917. 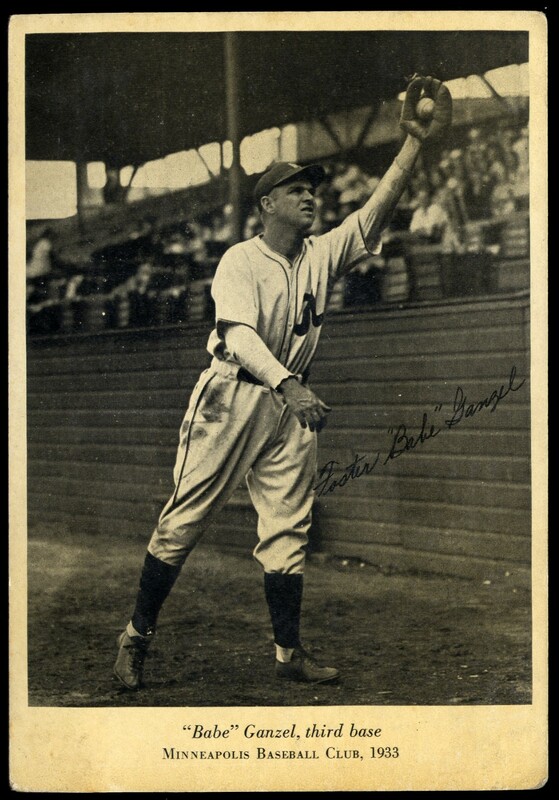 One of the players has been preliminarily identified as Ping Bodie, who only played with the A's in 1917. Any additional information or identifications would be appreciated. 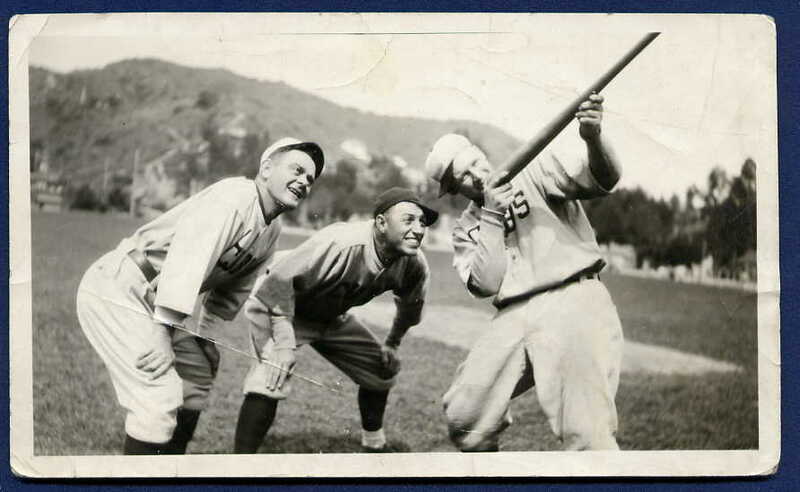 On this 1922 card, three unidentified members of the Chicago Cubs are clowning around Spring Training on Catalina Island, off the coast of Los Angeles. For more Cubs on Catalina, visit the Real-Photo Postcard Gallery. An exceedingly rare issue, these 1932 postcards depict individual members of the Buffalo Bisons of the International League. 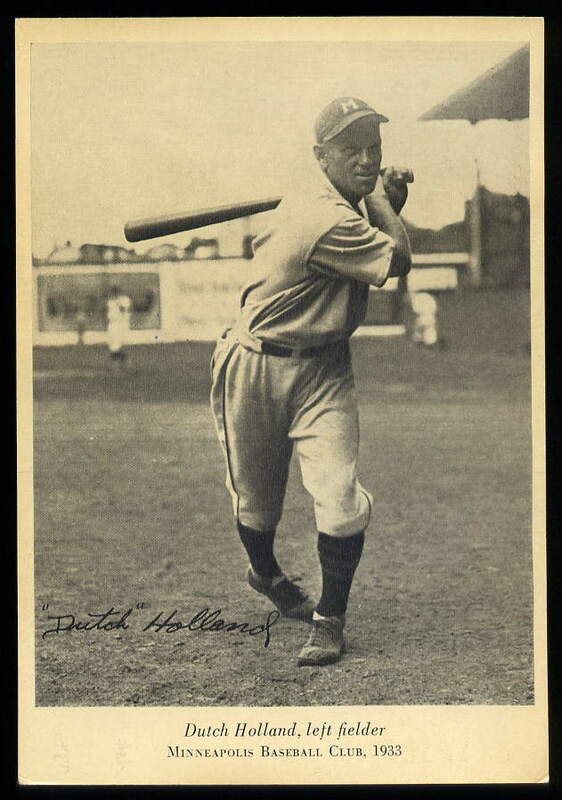 The card at left shows the team's biggest star -- Ray Schalk, its manager. Schalk is a Hall of Famer who is best remembered for being one of the "clean" members of the 1919 Chicago White Sox. The last of the pre-war tobacco issues, this card was released by the Fendrich Cigar Co. to promote Denby Cigars. 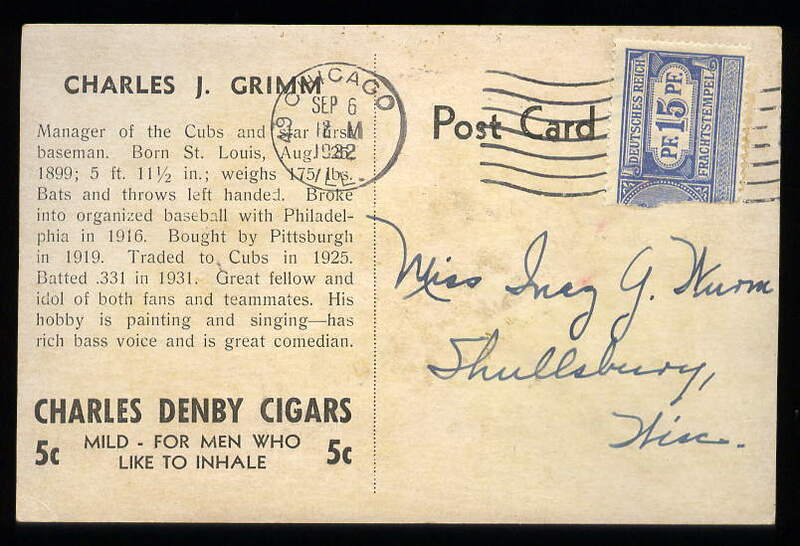 The cards are devoted to the hometown Cubs, with this example showcasing manager Charles Grimm. 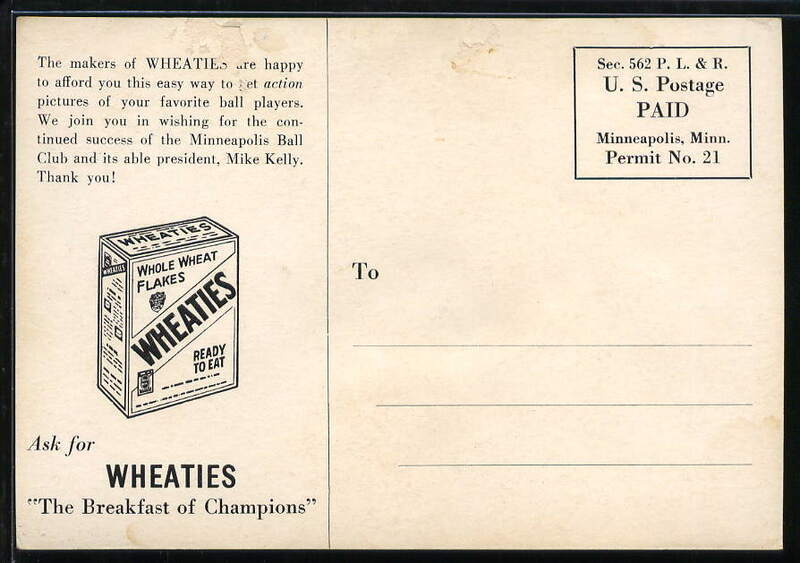 These 1933 postcards mark the first Wheaties baseball issue and feature players from the cereal maker's hometown Minneapolis Millers team. Left fielder Dutch Holland is at left and third baseman Babe Ganzel at right. The backs sport an ad for the "Breakfast of Champions" and even laud Millers team president, Mike Kelly. 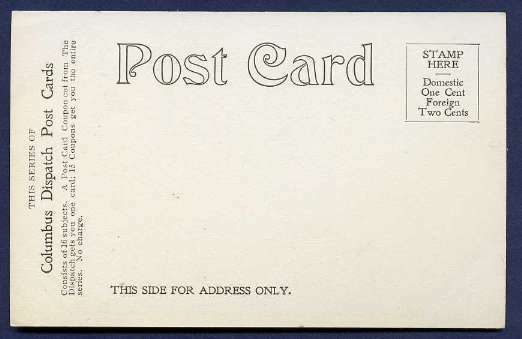 The unmailed cards are tough to find without the word "void" appearing on the reverse as a cancellation stamp. From 1937 through 1939 the Dayton, OH photographer, Orcajo, issued a series of Cincinnati Reds postcards. Some of the cards carried ads for Val Decker Packing, a meat company,or the Metropolitan Clothing Co. 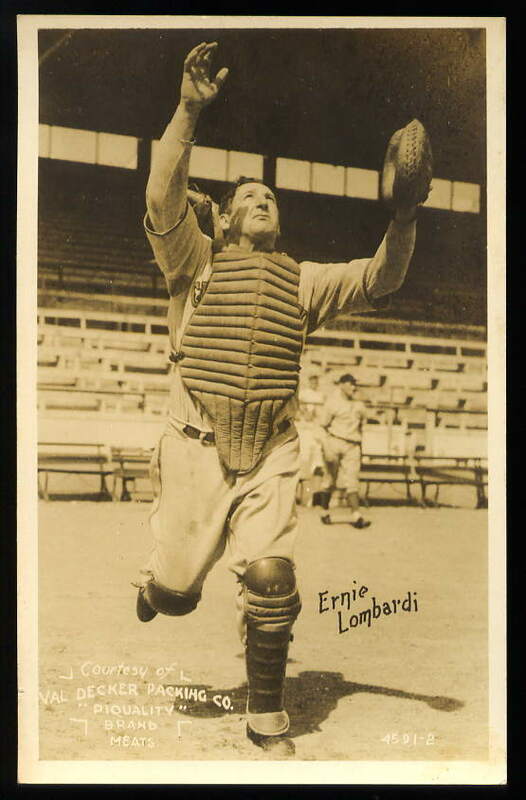 This card of Hall of Fame catcher Ernie Lombardi sports the Val Decker ad line on its front. Produced from 1950 to 1956, these postcards from JJK Copyart were likely used by the players themselves to respond to autograph requests. 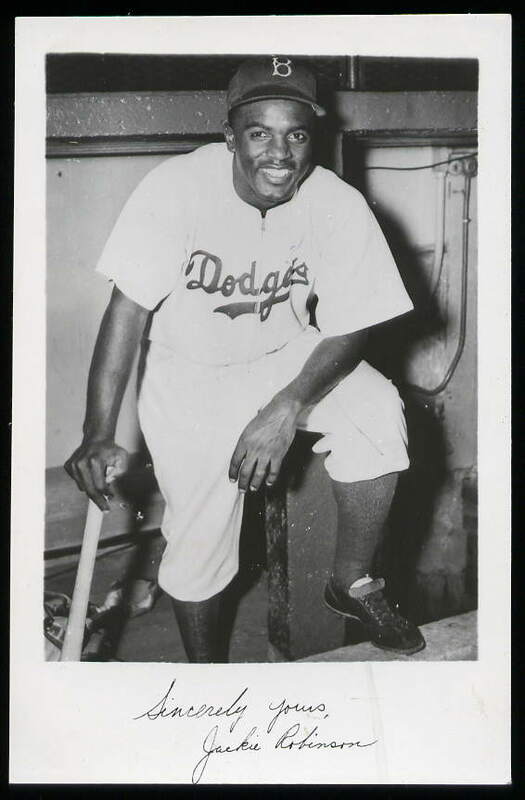 This specimen depicts a classic pose of Jackie Robinson. This 1940s Cuban Real Photo postcard likely was issued in 1947 or 1948 and features Cuban legend, Adolfo Luque during his managerial days. 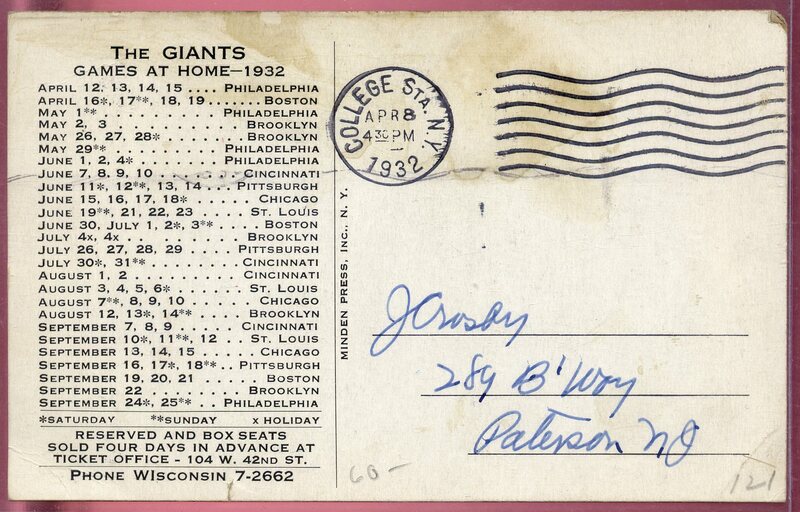 1932 NY Giants Schedule Postcards by Minden Press. 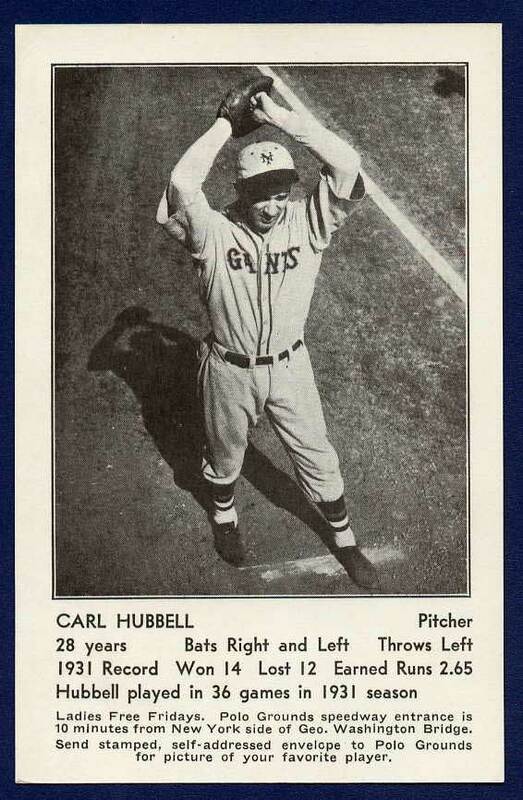 They are available on two stocks: a high quality postcard stock and a thinner paper vesrion which was only used for some cards depicting Carl Hubbell. The Hubbeli is the most common. 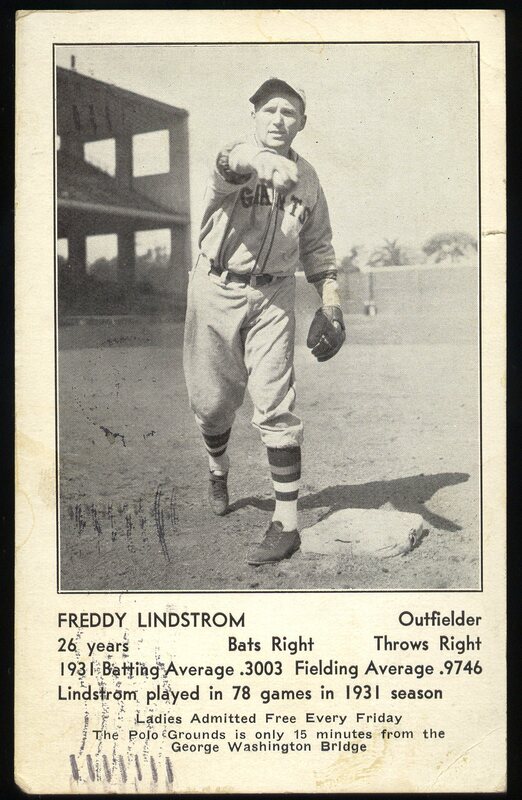 Others, such as this one of Freddie Lindstrom, are very scarce. 1915 Real Photo postcard from the Walter Johnson estate, showing Johnson, Clyde Milan and other team members preparing to embark for Spring Training. The photo was taken by Thomas A. Sullivan of The Evening Star newspaper in Washington D.C., whose blind stamp appears at lower right. 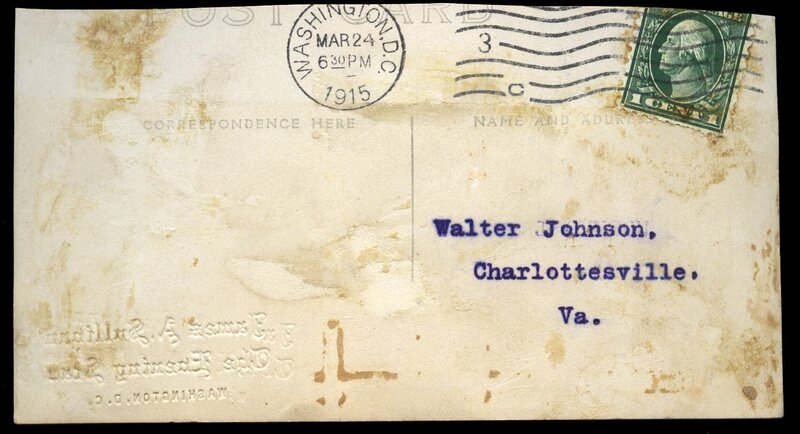 The reverse shows that the card was addressed simply to Walter Johnson, Charlottesville, Virginia and was correctly delivered to the superstar at his Spring Training home in March of 1915! 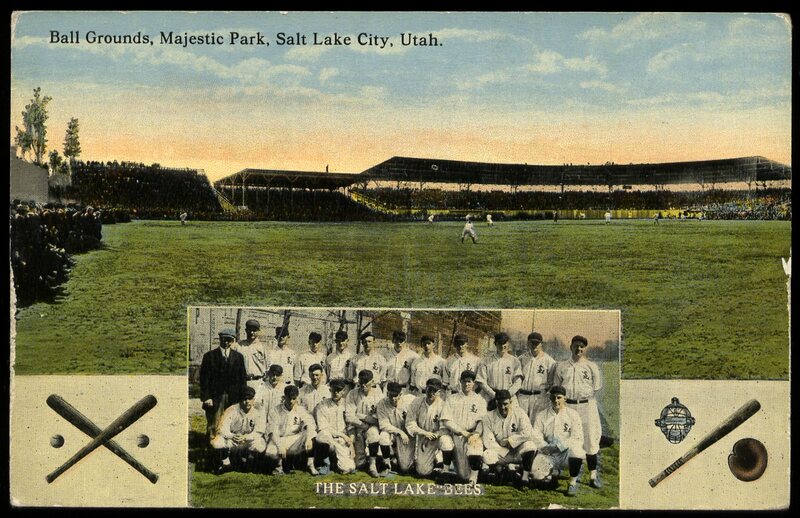 Likely issued c.1915 when the Salt Lake City Bees entered the Pacific Coast League, this postcard features colorized photos of both Majestic Park and the team itself. Published by Souvenir Novelty Co. of Utah, the card's reverse includes an image of a beehive with the slogan "Busy all the Time." . 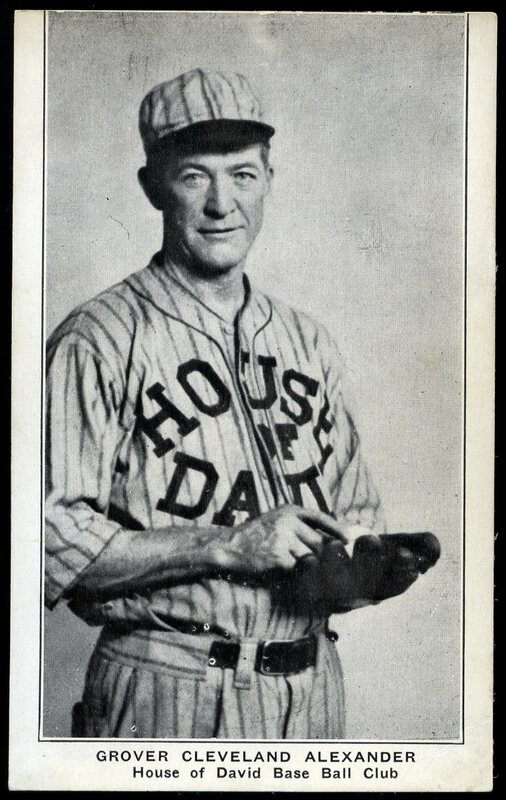 Scarce postcard of HOFer Grover Cleveland Alexander with the House of David team, with whom he played in the early 1930s after his MLB career ended. 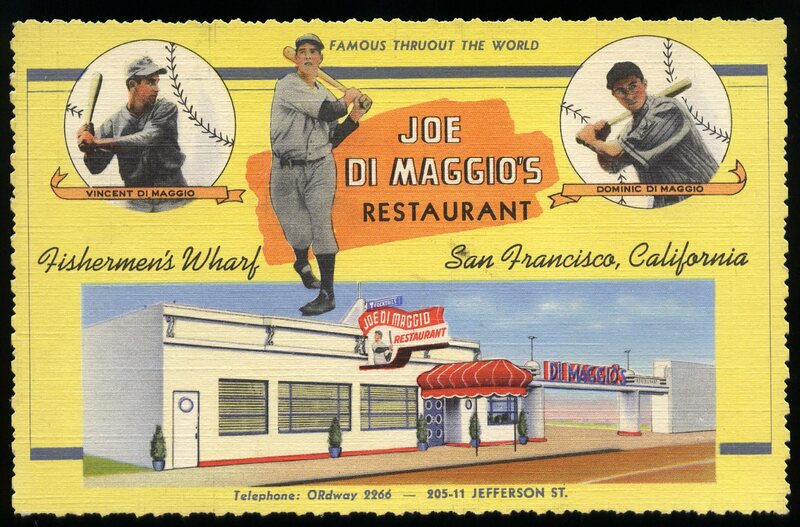 Deckle-edged, linen postcard featuring Joe DiMaggio and his San Francisco reestaurant. Several different variations of this colorful card exist. 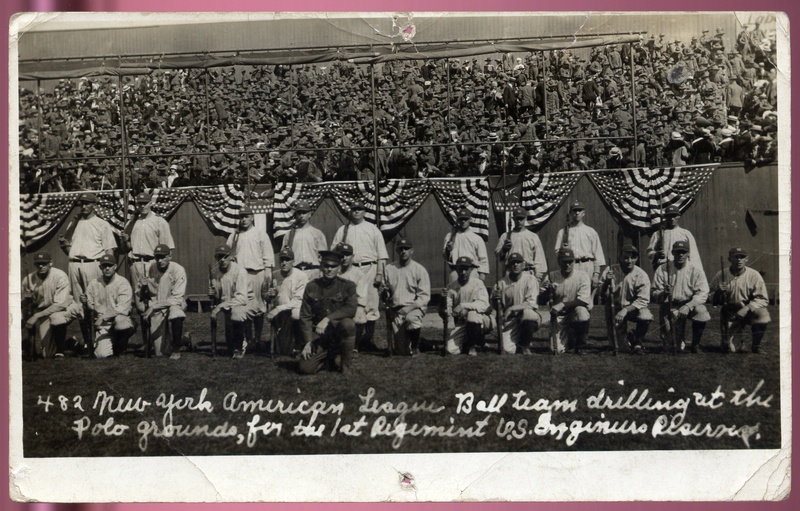 This extremely rare real photo postcard from June 1917, shows the New York American League ball team drilling at the Polo Grounds with rifles, raising money on behalf of the U.S. First Reserve Engineer Regiment. Proceeds from a baseball game and concert were donated to the unit, which had begun training in May 1917 at Fort Totten in Queens, NY. 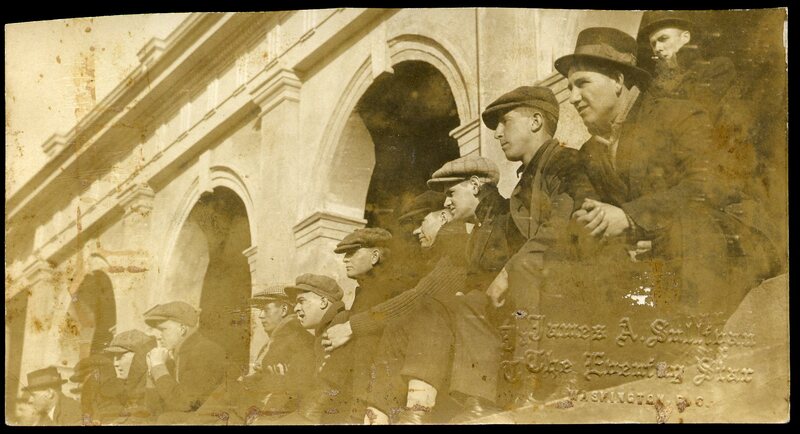 Such stars as Frank "Home Run" Baker, Roger Peckinpaugh and Bob Shawkey are visible, with soldiers in the stands behind them. It had been a little over two months after America entered World War I when this photograph was taken and the Yankees were doing their part. 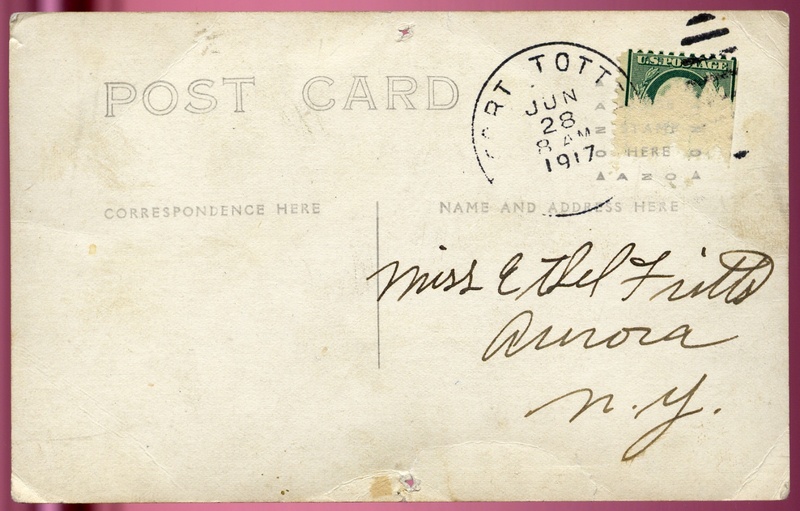 The card was mailed from Fort Totten, presumably by a member of the regiment. 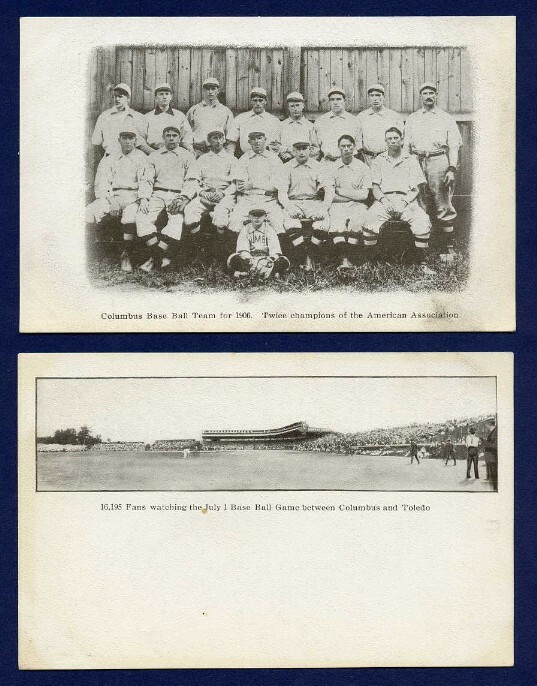 Very scarce panoramic postcard of the 1916 Los Angeles Angels, who won the Pacific Coast League (PCL) championship. Manager and future Hall of Famer, Frank Chance can be seen in an inset portrait photo and in uniform at the center of the team photo. Many major leaguers played for this team, including Harry Wolter, Doc Crandall, Ted Easterly, Bob Fisher, Charley Hall, Rube Ellis and the wonderfully named, Zip Zabel. 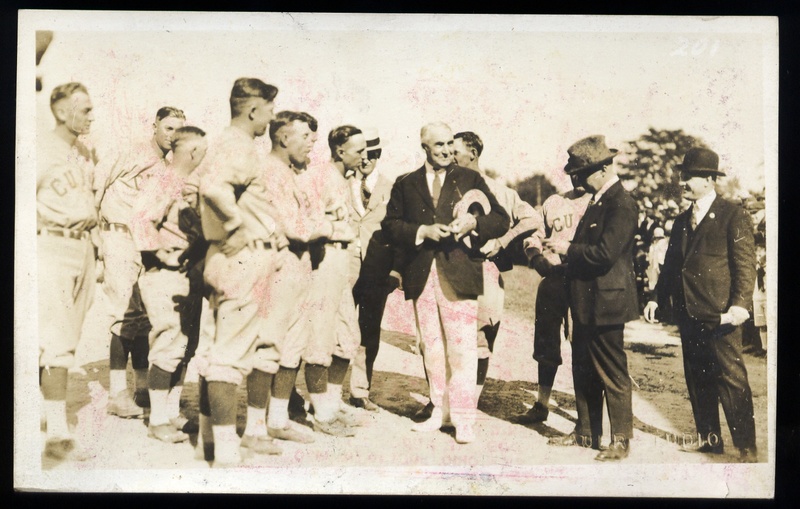 Republican Presidential candidate, Warren Harding, is seen on this real photo postcard with the Chicago Cubs and their star, Grover Cleveland Alexander in Marion, Ohio on September 2, 1920. Marion was Harding's hometown and the site of an exhibition game against the Kerrigan Tailors of the Ohio State League. The Giants, Reds and Indians all refused to take part in a politically charged event. The Cubs' presence, however, was assured by Albert Lasker and William Wrigley, the team's owner, who were supporting Harding. Lasker was an ad exec and part owner of the Cubs, known for his work promoting Puffed Wheat, Pepsodent and Lucky Strikes. The Cubs visited Harding's front porch before the afternoon game, as Harding was known as the "Front Porch Candidate. 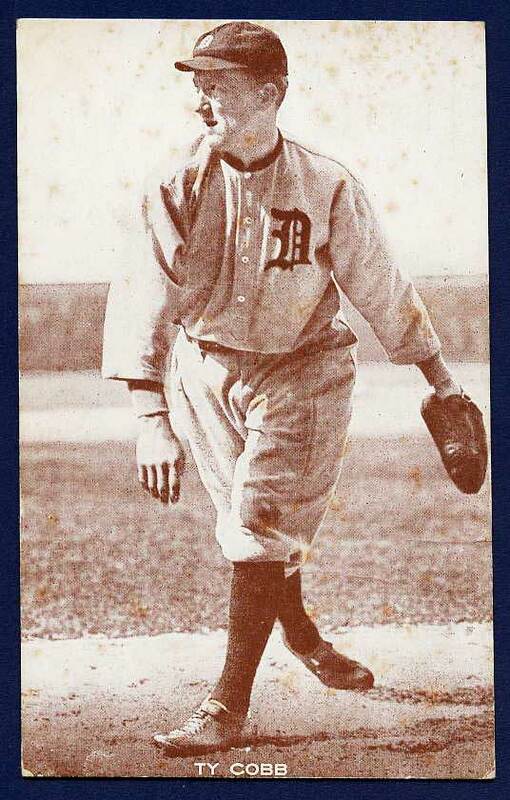 ".Harding played catch with Alexander and later threw three pitches for Kerrigan, "striking out" Max Flack as the Tailors fell to the Cubs 3-1 at Lincoln Park. 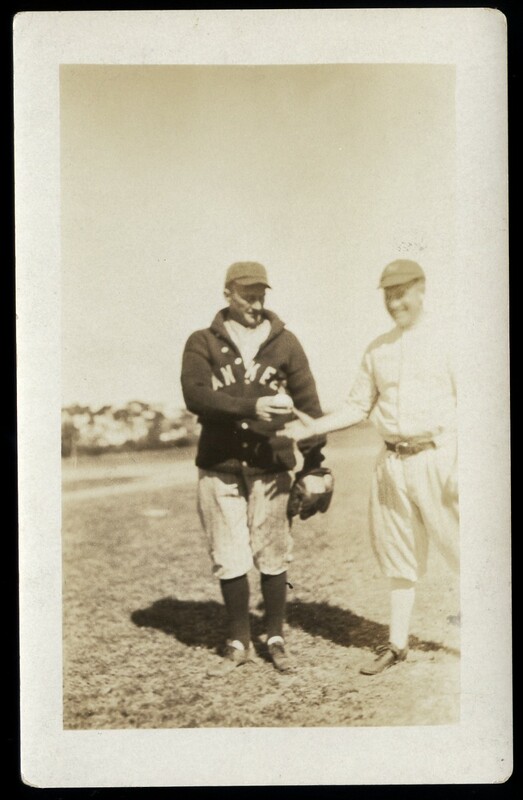 Circa 1920s real photo postcard of two unidentified members of the New York Yankees. It is possible that the year is 1927 and the figure at center is coach Art Fletcher, perhaps with Joe Dugan. 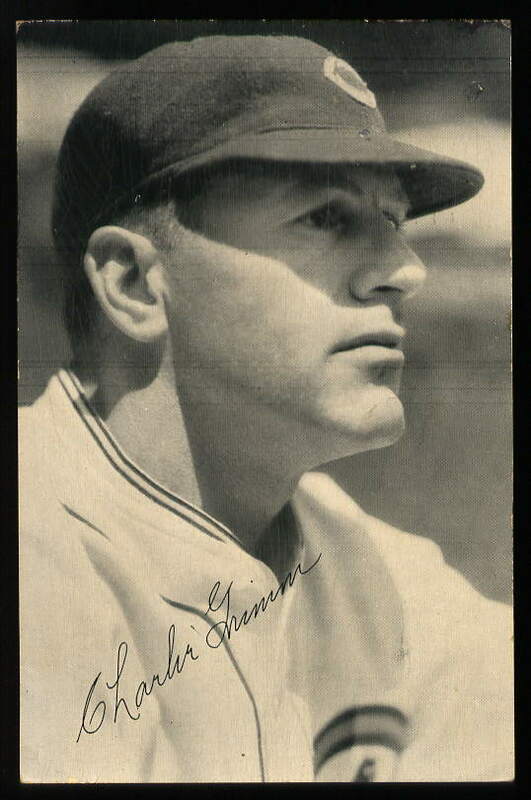 Very rare Ferburary, 1935 real photo postcard of Lou Gehrig, the "Iron Man of Baseball," with a facsimile autograph on the front. This specimen was addressed by hand by Gehrig and mailed from his hometown of New Rochelle, NY. For comparison, see this autographed copy that was mailed a few days prior and recently was auctioned by Leland's. Note the 'K's and 'P's. 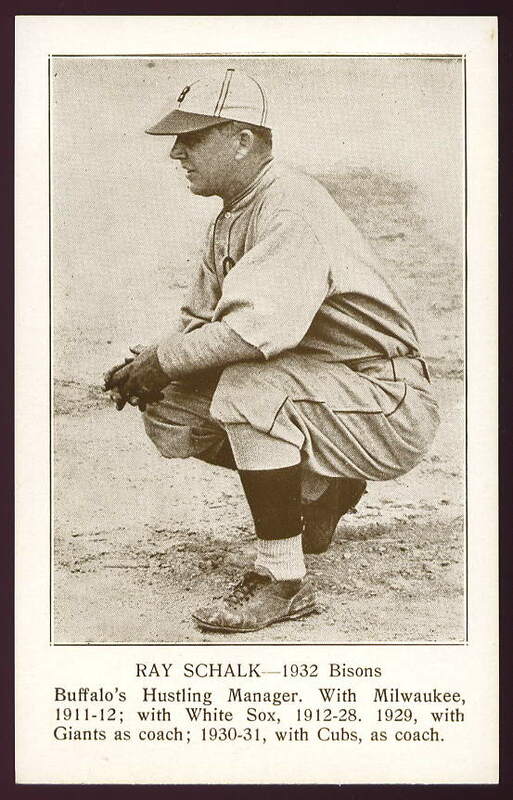 "Babe" Ganzel, star power hitter for the 1933 Minneapolis Miners is seen on this Wheaties postcard.